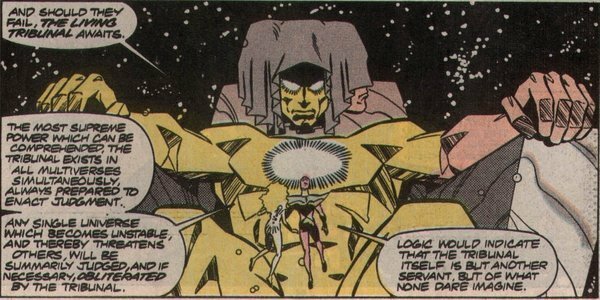 I believe astro-gods is a reference to the genocidal beings from the First Firmament mentioned in the Marvel Boy mini. I know she's like adding dog poo to a cake recipe. You'd have a nice cake if it wasn't for that one discordant element. Nah, she's one of the more interesting characters Marvel has. That was a good read and so maybe it is a first impression thing but she is no worse or better than any other average character. A writer could later create a connection, but there isn't one now or at least, there's no reason to believe there is one. The Beyonders do not fit in. They are beyond or foreign to the entire multiverse. and what's the FF's connection to the One Above All (non Celestial guy)? TOAA has repeatedly been shown as a metaphor for the creators at Marvel. Thus, TOAA created the FF. Maybe I'm asking a bit much.. but I have to say.. I wasn't impressed. The First Firmament did not create the first universe. The First Firmament is the first universe. Obviously it was created by The One Above All. Not exactly. Galactus is not Eternity per se. He is the last survivor of the previous universe, Galan, bonded with the sentience of his universe's Eternity, which is from the sixth iteration of the multiverse. I'm sure many longtime readers would be interested in that story, myself included. No, that was not your point at all. Your point was that the Celestials created the multiverse. Your point was not that one event happened, followed by another event, followed by another event, resulting in the creation of the multiverse. I am exposing the fallacious logic of your argument, which you have not addressed. You initially attempted to claim that that the Celestials created the multiverse. That claim is fallacious, wrong, incorrect, nonsense, rubbish, disproven. Instead you are now attempting to move the goalposts by saying that one event follows another in a causal chain, and that should one event not occur, subsequent events would not occur, which exposes once again your conflation of creation and causation. 1: The world is all that is the case. 1.1: The world is the totality of facts, not of things. So no refutation of what I argued. Thanks for waving the white flag. As far as "disparaging" goes, as illustrated by your statement "z is not some separable element from y", you've never read a line of Wittgenstein. Literally not one line. I'm neither familiar with you nor with your medical history, but this sounds like paranoia. Consult your doctor.